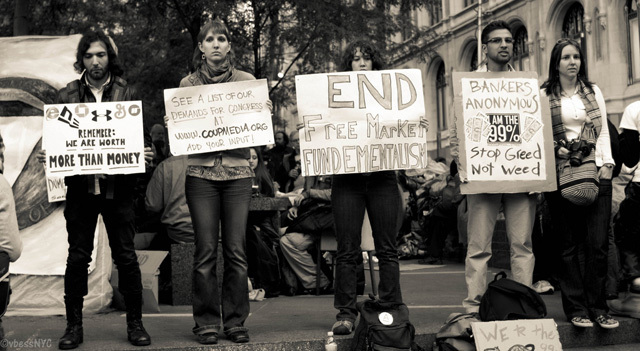 Now in over 1500 cities worldwide, the Occupy Wall Street protest movement is looking more and more like it will have staying power on a massive scale. The movement is still trying to refine its demands and specific grievances. Its main focus is economic injustice, but some groups within the movement have a much broader lists of complaints. 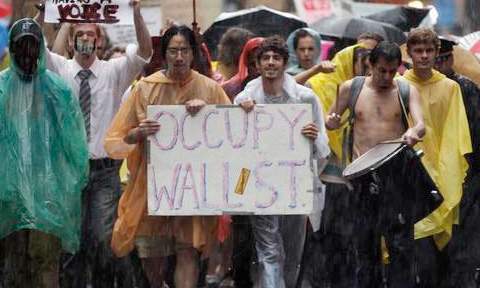 One thing that is for certain, this is not simply a group of hippies—as Fox New coverage would have you believe. This is a highly diverse group that is expressing the spirit of democracy. This thrust is felt by people on both sides of the isle. This is not about left or right…it is about being American, in an America that is fair and just. Here are some of the demands and declarations that have been made. This document was accepted by the NYC General Assembly on September 29, 2011, with minor updates made on October 1, 2011. It is the first official, collective statement of the protesters in Zuccotti Park. 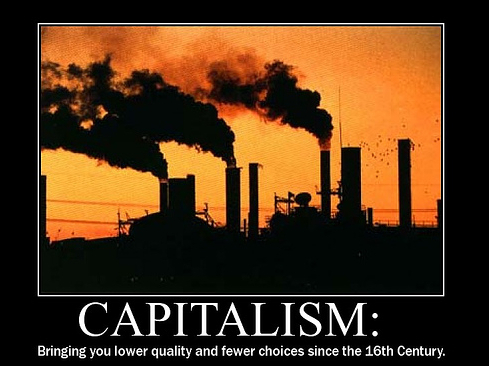 Capitalism can mean dramatically different things to different people. To a Wall Street executive it means being able to accumulate unimaginable wealth. To big business it may be a competitive game that must be won at all costs, even at the expense to the public interest. To a small businessman with a great idea, it might mean being able to turn his passion into an occupation, and enjoy the freedom of self-employment. To many, it is a system that has increased the standards of living for millions. To its victims, capitalism is a monster whose greed leaves many behind, and even commits great crimes against vulnerable citizens. Which view is correct? All of them. If by “capitalism” we mean creating markets that meet the needs of the public, allowing the best ideas and products to succeed through demand, then this is a highly democratic system that should be encouraged. If capitalism means “greed is good,” and we should look out for our own self-interest at all costs than this is a very anti-social, destructive philosophy that must be tempered. According to Mother Jones Magazine, “Just before the market crashed, one Wall Street manager wrote to another, ‘Let’s hope we are all wealthy and retired by the time this house of cards falters. '” This is one small example of how the greedy version of capitalism can lead to untold suffering (market crash, lost retirements, unemployment, etc.). Over the past two years, as the dust of the Great Recession began to settle, a host of business leaders and prominent economic leaders have started to imagine a new kind of capitalism; one that is responsible, broadly-enjoyed, and sustainable. Below, we have included excerpts from these leaders, including Bill Gates, Michael Porter, Elizabeth Warren, James Galbraith, Joseph Stiglitz, Fareed Zakaria, and others. There are common themes in their writings, including the need to regulate corporations, balance the interests of the public and private profit, and the need to have a strong social purpose that goes beyond the profit motive. Here’s an unfortunate Labor Day message. A new report by the Institute for Policy Studies found that CEOs who laid off the most workers made the most money over the past couple if years. No wonder the recession continues. The trends with health insurance benefits are also disturbing. Another unfortunate fact on this Labor Day, is that unions continue to diminish in their influence and numbers. Workers’ unions have fought to give all of us 40 hour working weeks, weekends, minimum wages, child labor laws, and so much more. Obama needs to follow through on his promises to support and promote union growth. With the prolonging of the recession (partly because businesses won’t start hiring, even when they are plenty profitable), pushing union growth is not an acceptable political move, unfortunately. On the one hand, we have the crimes of “tough” CEOs who prove they can’t succeed without slashing payroll and benefits, and on the other hand we have the diminished influence of unions who bargain for the collective interests of workers. These two trend make help corporate profits in the short term, they they harm the economy over the long term. They are proving again that our system needs significant reform. Happy Labor Day. It is, after all, a day off work. But we still have too many people who can’t go back to work tomorrow. What does is mean to “hold BP accountable”? We have heard this phrase over an over during the past month, as the Federal government responds to the Gulf crisis. We heard figures like $20 billion “slush fund for claims.” We even heard BP’s CEO, Tony Hayward, get grilled before a congressional committee hearing (with the exception of Republican Representative Joe Barton’s apology to Mr. Hayward about the “tragedy” that BP had experienced during this “unprecedented” government “shakedown” of a private corporate). But is this accountability? As I listened to the hearing on C-SPAN, my sense was that this was a slap on the wrist. Mr. Hayward took his punishment (6 hours of lecturing), and had about five responses ready; and he found a way to use these responses in just about every question. Hayward got his lecture, and then he was off on his yacht for a little fun. Meanwhile, this is what is happening in the Gulf (watch this video). Occasionally my masochistic impulse kicks in and I turn on the Sean Hannity Show while I am driving. I sat and listening to a discussion about how the BP oil spill is the fault of: (1) environmentalist, because they pressured oil companies to have to drill further out to sea; (2) Obama, because the liberals blamed Bush for Katrina, so this time it is Obama’s fault; and (3) government regulation, because it makes drilling far more difficult and expensive, leaving less time for managers to focus on maintenance and safety. Never mind the bizarre reasoning. I called in to ask Sean what he thought of the affect on business, in tourism and fishing…I didn’t get through. Maybe tomorrow.